A coronary artery fistula generally occurs when one of the coronary arteries fails to form properly during the development of the baby. 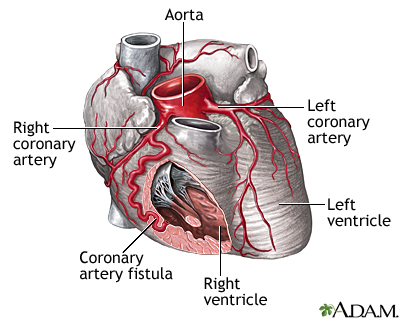 Coronary artery fistula is an abnormal connection between one of the coronary arteries and a heart chamber or another blood vessel. Coronary artery fistula is a rare condition and infants who are born with it sometimes have other heart defects.